This Psalter is famous for, and named after, its full-page miniature of a map of the world, which is related to the famous medieval map of the world (Mappa Mundi) at Hereford cathedral. But it also has a series of full-page miniatures of the life of Christ, added late in the 13th century; historiated initials at the usual psalter divisions; and an unusual image of the Virgin and Child. The calendar and other features suggest a London/Westminster origin, and the presence of the feast of Richard of Chichester, canonised in 1262, provides the earliest possible date for the production of the book. The imagery for Psalm 101 varies in illuminated Psalters, but it sometimes has a representation of the original owner of the manuscript. Here a Benedictine monk, identifiable from his tonsure and black habit, kneels in prayer at an altar, looked down on by Christ. 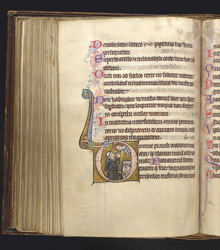 The litany of the psalter is also Benedictine, suggesting that it may have been made for this monk.